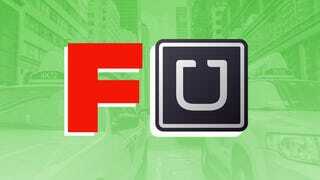 Uber drivers attempting to follow the law are getting screwed by Uber in California. A Buzzfeed investigation revealed that Uber suspended at least 12 drivers last month for properly registering their cars as commercial vehicles. To get their jobs back, Uber said the drivers had to re-register the cars as personal vehicles, which is a clear violation of DMV rules. Around the same time, Uber began temporarily suspending the accounts of some drivers with Uber financing whose cars were registered as commercial vehicles. "We are showing your vehicle registration is actually a commercial vehicle registration," a late-December email from an Uber representative to one suspended driver read. "We will need you to contact the DMV to have them update your vehicle registration to personal/automobile registration. We are unable to accept commercial registration on an uberX account." Update 11:15 AM: Uber maintains that this email was an error, and is not company policy. One Southern California auto dealer who has sold numerous cars through Uber's finance program but insisted on registering the cars as commercial vehicles said that roughly a dozen UberX drivers called the dealership in a panic because they'd been suspended for the same reason. Fearful they'd have to give up their cars because finance payments are deducted automatically from their Uber earnings, several of those drivers decided to switch to personal registration, the dealer, who requested anonymity, said. This is absurd. I've asked Uber whether it plans to pay the legal bills for drivers who are ticketed for violating California vehicle registration laws, and will update if I hear back—even if Uber does plan to shell out if a crackdown goes down, the $41 billion dollar company should not be hanging drivers out to dry like this. Instead, it should be helping drivers with the extra costs incurred by properly registering their cars. Uber's 160,000 drivers aren't chauffeuring people for their health. They need the money. And forcing a big chunk of them to either give up their livelihood or break the law is no way to run a business. Update, 11:15 AM: So Uber is not denying that a representative sent the emails, but the company insists that deactivating cars for registering as commercial vehicles is not company policy. An official response is forthcoming. While it's heartening that this is NOT company policy, it's strange and difficult to swallow that there could be so much confusion that drivers were suspended in the first place. I hope the backlash from this incident will galvanize Uber to sort out whatever's going on there to cause this kind of driving-screwing error. Update, 12:18 PM: Here's the official statement from Uber. "How a driver registers his/her vehicle is up to that driver. Uber does not require a driver to register his/her vehicle as personal, and it is not our policy to deactivate a driver for registering his/her vehicle as commercial."